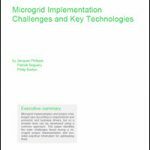 The microgrid opportunity around the world continues to grow significantly. One recent report forecasts a compound annual growth rate (CAGR) of 12% between 2016-2022, reaching $35 billion by 2022. * The reasons for this expected positive development include the falling cost of solar energy, advances in energy storage, the drive to mitigate climate change, and the cost savings associated with minimizing fossil fuels in remote generation systems. In addition, microgrids will play a central role in bringing electrification to rural and developing regions in which access to reliable, clean and affordable energy is a high priority.